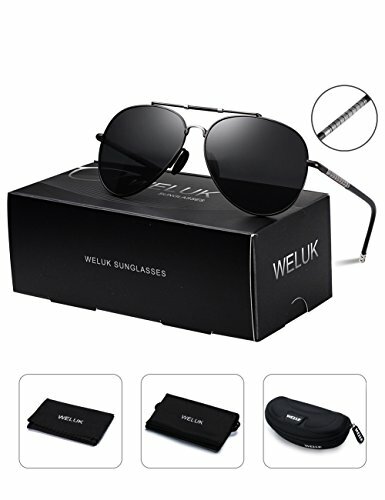 Multi-Function & Lens Color: The stylish design aviator sunglasses are great suitable for fishing, dirving and air force etc. outdoor activities. stylish design, with rich color combinations of frames and lens. New Screw Threads Arms Design & Light-Weight: The screw threads arms and Light-weighted & elastic arm gives you stress-free wearing experience and is Skin-friendly,anti-allergy tested; UVB rays. Multiple lens layer technology enables polarization, durability, UV protection and shatterproof features. Skin-friendly Nose Pads: Environmental & skin-friendly materials.Elastic and weight-free features enables you a long-time wearing without fatigue.The advantage is relatively stable shape, by the external force is not easy to deformation. 30 Day Money Back Guarantee - 100% satisfaction guaranteed. That is our promise. So, if you\'re not completely happy with your purchase within the first 30 days, just let us know. We will do whatever it takes to make it right.Any questions you have, pls feel free to contact our customer service.